Women can be so mean! Women can be jerks. They can say some of the most hurtful things to each other & then wrap it all up in a sugary, fake smile. And what are women most intimidated by? Other women. Now, in a way I can understand some of this hostility when it comes to competition for dates or jobs…but outside of that, I just don’t get it. Why are women at odds with each other; judging, competing, and intimidating each other? I’m a bit of a plain jane. I am void of fashion & style. I’ve never been into the whole hair & make-up thing. Even when I had a paying job or, before babies, went to bars I cared more about how I felt than how I looked. Please don’t take my “I don’t care” attitude toward make up & high heels as laziness; it’s just that it’s not important to me & I have a lot of important stuff going on. I’ve had very long hair for most of my life because I always felt that a pony tail was the easiest thing to do with it. But, after the birth of my 3rd child, I decided to chop it all off. I cut it short short–like a boy. At first I really liked it, but after the post-partum shed was over I started longing for my locks again. So, I stopped trimming my hair & just let it grow. Yup. I’m at that awkward shaggy stage. Nope, it’s not pretty. But unflattering hair is just one of those things that you have have to go through when growing out a pixie cut. And besides, who exactly do I have to impress anyway? Well, apparently my female “friends”, that’s who. 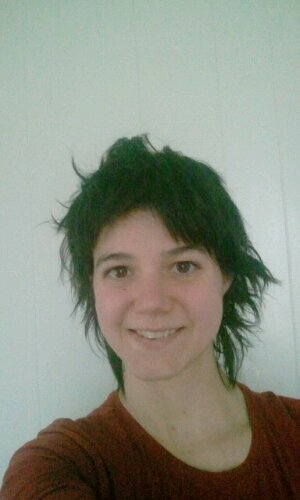 I’ve endured snarky comments about my weight, my clothes, my lack of make-up, and now my hair. I get it ladies!! I’m not a glamorous super model; heck, I’m not even picture perfect. But you know what, despite your ugly remarks thinly veiled by false friendship, I am still confident in myself. You are seeing the me, the real me. Call me ugly if that’s what makes you feel prettier, but at least I have the guts to be real. We were having some impromptu friends visiting yesterday afternoon, so my husband & I were scurrying about the house trying to clean it up a bit. As I was vacuuming the floors, Hubs was cleaning the bathroom. We ended up meeting in the kitchen, I think he was putting dishes away, and I was putting the vacuum in the recharger, ignoring the crying baby, who was probably mad that I was ignoring him. But when the vacuum turned off, I noticed that his temper tantrum was different. He was standing in doorway with a red face and sea-green foam spewing from his mouth. “What the hell did he get into? !” I screamed as I scooped him up & fled to the sparkling clean bathroom. I passed him off to my husband as I came upon the overturned canister of Comet cleanser. Hubs cleaned the baby’s mouth out with water at the sink while I held my toddler in the hall. After the mouth was washed out, the baby vomited all over floor. 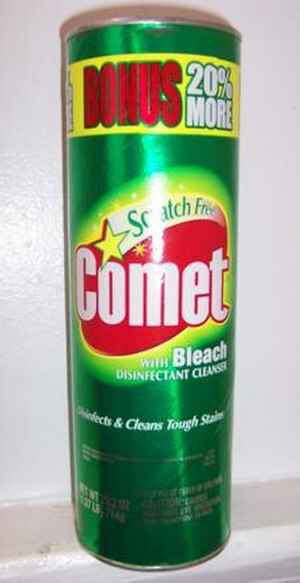 So Comet does make you vomit! I demanded Hubs to call Poison Control instead of giving him peroxide to induce more vomiting. I didn’t know…I did know that sometimes vomiting is a good thing to do, sometimes it’s a very bad thing to do…I wanted to be sure with my little 13 month old. The outcome: Basically we were told that he may have an upset stomach & some irritation. The woman on the phone suggested we give him an ounce or so of juice, and as long as he didn’t continue to vomit, he’d be fine. *Sigh* We washed his hands again, just to make sure, then brushed his teeth to get the taste out. And yes, he was fine. Juggling with Babies: My! My Hands are Full! I get some of the strangest comments from the general public & I’m often astounded at what people will say out loud to a complete stranger. I hear a lot of things, but what I hear the most is some variation of “My, you have your hands full!” This often comes in the grocery store when the toddler is walking beside the cart & the baby is in the sling on my hip, or asleep in his car-seat in the front of the cart. I always hear an accusatory tone in the commenter’s voice, as if I’ve done something socially wrong by having two children so close together (they are 18 months apart). Usually when I hear this, I just smile & nod or mumble something bland. But sometimes I’m just in a mood & I say something back like “Well, only this one since the toddler can walk now”, or “That’s only because I stopped carrying them in my teeth like kittens”. I mean, come on. I have two very small children. I am well aware that my hands are full. And what’s with the tone? I’m not the first mother to tote two tots through a shopping mall. Are they assuming that they were accidents that I’m now paying for as if I didn’t know where babies came from? When my kids are in public they usually are very well behaved angels, so I never feel like my “hands are full” at the grocery store, the shopping mall, or a restaurant. They don’t cry, they don’t fuss, so why people assume that my hands are full kind of baffles me. What’s also baffling to me is that most of these comments come from other women, who, I’m assuming have or have had children. Perhaps they have/had ill behaved offspring & assume mine are as well and it’s just a strain of sympathy coming my way…I realize that most who people say this are really trying to say “I see & acknowledge that you have two children & feel that your life must be busy as a result”; although most people feel that that’s not the right way to say it, so something dumb falls out instead. I can’t be the only mother with more than one kid who hears this, so it makes me wonder: why aren’t other people in society slapped with duh comments? I mean, if folks are “seeing & acknowledging” my kids, why aren’t there socially acceptable comments for seeing & acknowledging the morbidly obese, the incredibly stupid, or the fantastically fashion failures? Or why can’t we just say anything out loud about other people that pops into our heads? You see, kids are like juggling. Once you get going, it’s not so bad. You just have to keep your balls in the air & maintain focus. With two kids I can still mop the floors, make dinner, teach the A B Cs, write a blog post, compose a grocery list, and put on eye liner, all with my free hand. Once I get a couple things going, it’s no big deal and if I drop something, eh, whatever. I pick ’em up, kiss their blonde little heads & start over. There’s no need to assume that these children give me a hard time, just as there’s no need to assume that I’m paying for anything. Yes, my hands are full & I’m a busy mom. But you know what, that’s what I wanted & there really isn’t anything wrong with that. Duh!